As is to be expected during the holiday season home sales begin to slow down as fewer luxury homes are bought and sold. Fewer sellers are looking to put their homes on the market during the holiday season due to travel or family visit plans. The upcoming tax bill making its way through congress could change the landscape of real estate by eliminating or limiting mortgage interest deductions as well as increasing the time required for a home seller to be in a home to get a tax break on any gain from the sale of their home. Currently a homeowner must live in a house for at least two of the last five years to be entitled to a tax free gain from the sale of $250,000 for a single person and $500,000 for a married couple. In the tax law as proposed the timeframe would change to require homeowners to live in the home for at least five years out of the last eight years. That change in time required to live in a home could potentially slow down housing sales since people will have to stay longer in the home if they want to sell and not be taxed on the gain. Ultimately what the final tax bill says still remains to be seen as the U.S. Senate and House of Representatives are still negotiating a reconciled bill to send to the President. Want to know what happened during the October 2016 Northern Kentucky Real Estate Market sales period? You have come to the right place. Read on to get the latest statistics and information in the October 2016 Northern Kentucky Real Estate Report. Home inventory is still low around the Greater Cincinnati area compared to a year ago. In October there were 198 homes that sold during the month for Boone County, 118 for Campbell County and 244 homes that sold for Kenton County. Homes that went pending in October were 77 for Boone, 71 for Campbell County and 114 for Kenton. The average listing price for homes in the Boone County area was $211,897.00 with an average selling price of $195,138.00. Boone County homes during the October time frame were on the market (Days on Market) for an average of 84 days. There are currently 510 homes available for sale in Boone County. The average listing price for homes in the Campbell County area was $271,313.00 with an average selling price of $165,803.00. Campbell County homes during the October time frame were on the market (Days on Market) for an average of 111 days. There are currently 339 homes available for sale in Campbell County. The average listing price for homes in the Kenton County area was $218,292.00 with an average selling price of $156,348.00. Kenton County homes during the October time frame were on the market (Days on Market) for an average of 93 days. Want to know what happened during the October 2016 Cincinnati Real Estate Market and Northern Kentucky Real Estate Market sales period? You have come to the right place. 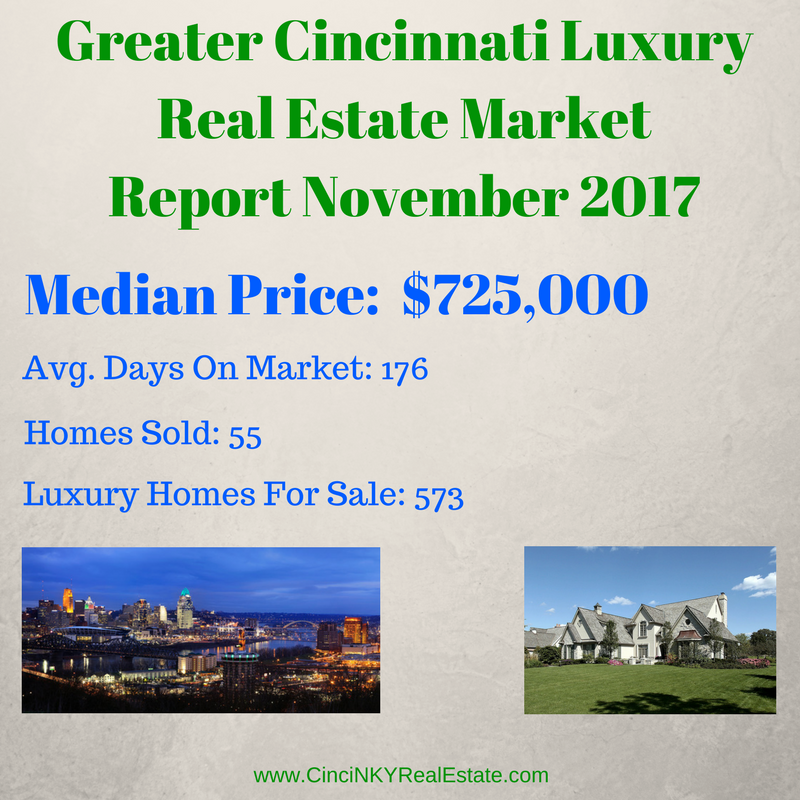 Read on to get the latest statistics and information in the October 2016 Greater Cincinnati Real Estate Report. Home inventory is still low around the Greater Cincinnati area compared to a year ago and sales are also up. In October there were 941 homes that sold during the month for Hamilton County and 283 homes that sold in Clermont County. Homes that went pending in October were 480 for Hamilton and 140 for Clermont County. Pending status means they had an offer accepted and were awaiting closing pending inspections, appraisals, financing etc. The average listing price for homes in the Hamilton County area was $275,727.00 with an average selling price of $193,842.00. Hamilton County homes during the October time frame were on the market (Days on Market) for an average of 82 days. There are currently 2,566 homes available for sale in Hamilton County. The average listing price for homes in the Clermont County area was $244,137.00 with an average selling price of $196,547.00. Clermont County homes during the October time frame were on the market (Days on Market) for an average of 76 days. There are currently 617 homes available for sale in Clermont County. Want to know what happened during the September 2016 Cincinnati Real Estate Market and Northern Kentucky Real Estate Market sales period? You have come to the right place. Read on to get the latest statistics and information in the September 2016 Greater Cincinnati Real Estate Report. Home inventory is still low around the Greater Cincinnati area compared to a year ago and sales are also up. In September there were 1032 homes that sold during the month for Hamilton County and 303 homes that sold in Clermont County. Homes that went pending in September were 506 for Hamilton and 139 for Clermont County. Pending status means they had an offer accepted and were awaiting closing pending inspections, appraisals, financing etc. The average listing price for homes in the Hamilton County area was $274,769.00 with an average selling price of $196,244.00. Hamilton County homes during the September time frame were on the market (Days on Market) for an average of 75 days. There are currently 2,796 homes available for sale in Hamilton County. The average listing price for homes in the Clermont County area was $241,303.00 with an average selling price of $185,396.00. Clermont County homes during the September time frame were on the market (Days on Market) for an average of 69 days. There are currently 678 homes available for sale in Clermont County. Want to know what happened during the August 2016 Cincinnati Real Estate Market and Northern Kentucky Real Estate Market sales period? You have come to the right place. Read on to get the latest statistics and information in the August 2016 Greater Cincinnati Real Estate Report. Home inventory is still low around the Greater Cincinnati area compared to a year ago and sales are also up. In August there were 1154 homes that sold during the month for Hamilton County and 290 homes that sold in Clermont County. Homes that went pending in August were 833 for Hamilton and 253 for Clermont County. Pending status means they had an offer accepted and were awaiting closing pending inspections, appraisals, financing etc. The average listing price for homes in the Hamilton County area was $273,363.00 with an average selling price of $181,193.00. Hamilton County homes during the August time frame were on the market (Days on Market) for an average of 70 days. There are currently 2,911 homes available for sale in Hamilton County. The average listing price for homes in the Clermont County area was $237,280.00 with an average selling price of $181,193.00. Clermont County homes during the August time frame were on the market (Days on Market) for an average of 62 days. There are currently 697 homes available for sale in Clermont County. Want to know what happened during the July 2016 Northern Kentucky Real Estate Market sales period? You have come to the right place. Read on to get the latest statistics and information in the July 2016 Northern Kentucky Real Estate Report. Home inventory is still low around the Greater Cincinnati area compared to a year ago. In July there were 232 homes that sold during the month for Boone County, 116 for Campbell County and 230 homes that sold for Kenton County. Homes that went pending in July were 129 for Boone, 79 for Campbell County and 137 for Kenton. The average listing price for homes in the Boone County area was $263,942.00 with an average selling price of $220,031.00. Boone County homes during the July time frame were on the market (Days on Market) for an average of 77 days. There are currently 573 homes available for sale in Boone County. The average listing price for homes in the Campbell County area was $229,392.00 with an average selling price of $163,029.00. Campbell County homes during the July time frame were on the market (Days on Market) for an average of 107 days. There are currently 360 homes available for sale in Campbell County. Want to know what happened during the July 2016 Cincinnati Real Estate Market and Northern Kentucky Real Estate Market sales period? You have come to the right place. Read on to get the latest statistics and information in the July 2016 Greater Cincinnati Real Estate Report. Home inventory is still low around the Greater Cincinnati area compared to a year ago and sales are also up. In July there were 1146 homes that sold during the month for Hamilton County and 262 homes that sold in Clermont County. Homes that went pending in July were 754 for Hamilton and 236 for Clermont County. Pending status means they had an offer accepted and were awaiting closing pending inspections, appraisals, financing etc. The average listing price for homes in the Hamilton County area was $275,806.00 with an average selling price of $199,550.00. Hamilton County homes during the July time frame were on the market (Days on Market) for an average of 71 days. There are currently 2,946 homes available for sale in Hamilton County. The average listing price for homes in the Clermont County area was $246,338.00 with an average selling price of $201,586.00. Clermont County homes during the July time frame were on the market (Days on Market) for an average of 64 days. There are currently 683 homes available for sale in Clermont County. Want to know what happened during the June 2016 Northern Kentucky Real Estate Market sales period? You have come to the right place. Read on to get the latest statistics and information in the June 2016 Northern Kentucky Real Estate Report. Home inventory is still low around the Greater Cincinnati area compared to a year ago. In June there were 236 homes that sold during the month for Boone County, 126 for Campbell County and 265 homes that sold for Kenton County. Homes that went pending in June were 140 for Boone, 72 for Campbell County and 151 for Kenton. The average listing price for homes in the Boone County area was $265,629.00 with an average selling price of $212,586.00. Boone County homes during the June time frame were on the market (Days on Market) for an average of 74 days. There are currently 584 homes available for sale in Boone County. The average listing price for homes in the Campbell County area was $244,292.00 with an average selling price of $168,121.00. Campbell County homes during the June time frame were on the market (Days on Market) for an average of 106 days. There are currently 372 homes available for sale in Campbell County. The average listing price for homes in the Kenton County area was $215,191.00 with an average selling price of $170,540.00. Kenton County homes during the June time frame were on the market (Days on Market) for an average of 77 days. Want to know what happened during the June 2016 Cincinnati Real Estate Market and Northern Kentucky Real Estate Market sales period? You have come to the right place. Read on to get the latest statistics and information in the June 2016 Greater Cincinnati Real Estate Report. Home inventory is still low around the Greater Cincinnati area compared to a year ago and sales are also up. In June there were 1186 homes that sold during the month for Hamilton County and 343 homes that sold in Clermont County. Homes that went pending in June were 737 for Hamilton and 156 for Clermont County. Pending status means they had an offer accepted and were awaiting closing pending inspections, appraisals, financing etc. The average listing price for homes in the Hamilton County area was $283,984.00 with an average selling price of $223,342.00. Hamilton County homes during the June time frame were on the market (Days on Market) for an average of 70 days. There are currently 3,022 homes available for sale in Hamilton County. The average listing price for homes in the Clermont County area was $243,677.00 with an average selling price of $203,418.00. Clermont County homes during the June time frame were on the market (Days on Market) for an average of 62 days. There are currently 691 homes available for sale in Clermont County. Want to know what happened during the May 2016 Cincinnati Real Estate Market and Northern Kentucky Real Estate Market sales period? You have come to the right place. Read on to get the latest statistics and information in the May 2016 Greater Cincinnati Real Estate Report. Home inventory is still low around the Greater Cincinnati area compared to a year ago and sales are also up. In May there were 1179 homes that sold during the month for Hamilton County and 288 homes that sold in Clermont County. Homes that went pending in May were 769 for Hamilton and 219 for Clermont County. Pending status means they had an offer accepted and were awaiting closing pending inspections, appraisals, financing etc. The average listing price for homes in the Hamilton County area was $276,930.00 with an average selling price of $196,187.00. Hamilton County homes during the May time frame were on the market (Days on Market) for an average of 74 days. There are currently 3,008 homes available for sale in Hamilton County. The average listing price for homes in the Clermont County area was $240,198.00 with an average selling price of $191,415.00. Clermont County homes during the May time frame were on the market (Days on Market) for an average of 62 days. There are currently 674 homes available for sale in Clermont County. Want to know what happened during the May 2016 Northern Kentucky Real Estate Market sales period? You have come to the right place. Read on to get the latest statistics and information in the May 2016 Northern Kentucky Real Estate Report. Home inventory is still low around the Greater Cincinnati area compared to a year ago. In May there were 228 homes that sold during the month for Boone County, 133 for Campbell County and 239 homes that sold for Kenton County. Homes that went pending in May were 205 for Boone, 87 for Campbell County and 217 for Kenton. The average listing price for homes in the Boone County area was $268,171.00 with an average selling price of $203,332.00. Boone County homes during the May time frame were on the market (Days on Market) for an average of 75 days. There are currently 560 homes available for sale in Boone County. The average listing price for homes in the Campbell County area was $243,347.00 with an average selling price of $157,510.00. Campbell County homes during the May time frame were on the market (Days on Market) for an average of 103 days. There are currently 389 homes available for sale in Campbell County. The average listing price for homes in the Kenton County area was $222,830.00 with an average selling price of $160,750.00. Kenton County homes during the May time frame were on the market (Days on Market) for an average of 88 days. Want to know what happened during the March 2016 Cincinnati Real Estate Market and Northern Kentucky Real Estate Market sales period? You have come to the right place. Read on to get the latest statistics and information in the March 2016 Greater Cincinnati Real Estate Report. Home inventory is still low around the Greater Cincinnati area which means buyers are having a harder time finding a home that they like and this also causes those thinking of selling their home to sit on the sidelines for fear of not finding a home if they do sell. In March there were 896 homes that sold during the month for Hamilton County and 255 homes that sold in Clermont County. Homes that went pending in March were 754 for Hamilton and 237 for Clermont County. Pending status means they had an offer accepted and were awaiting closing pending inspections, appraisals, financing etc. The average listing price for homes in the Hamilton County area was $281,961.00 with an average selling price of $193,780.00. Hamilton County homes during the March time frame were on the market (Days on Market) for an average of 83 days. There are currently 2,719 homes available for sale in Hamilton County. The average listing price for homes in the Clermont County area was $237,587.00 with an average selling price of $185,062.00. Clermont County homes during the March time frame were on the market (Days on Market) for an average of 68 days. There are currently 600 homes available for sale in Clermont County. Want to know what happened during the March 2016 Northern Kentucky Real Estate Market sales period? You have come to the right place. Read on to get the latest statistics and information in the March 2016 Northern Kentucky Real Estate Report. Home inventory is still low around the Greater Cincinnati and Northern Kentucky area which means buyers are having a harder time finding a home that they like and this also causes those thinking of selling their home to sit on the sidelines for fear of not finding a home if they do sell. In March there were 156 homes that sold during the month for Boone County, 103 for Campbell County and 241 homes that sold for Kenton County. Homes that went pending in March were 205 for Boone, 124 for Campbell County and 237 for Kenton. The average listing price for homes in the Boone County area was $253,120.00 with an average selling price of $196,859.00. Boone County homes during the March time frame were on the market (Days on Market) for an average of 84 days. There are currently 522 homes available for sale in Boone County. The average listing price for homes in the Campbell County area was $238,461.00 with an average selling price of $140,971.00. Campbell County homes during the March time frame were on the market (Days on Market) for an average of 110 days. There are currently 349 homes available for sale in Campbell County. There are currently 612 homes available for sale in Clermont County. Want to know what happened during the January 2016 Northern Kentucky Real Estate Market sales period? You have come to the right place. Read on to get the latest statistics and information in the January 2016 Northern Kentucky Real Estate Report. Home inventory is still low around the Greater Cincinnati and Northern Kentucky area which means buyers are having a tougher time finding the home they want when they want. In January there were 83 homes that closed during the month for Boone County, 66 for Campbell County and 120 homes that closed for Kenton County and . Homes that went pending in January were 95 for Boone, 69 for Campbell County and 166 for Kenton. The average listing price for homes in the Boone County area was $246,765.00 with an average selling price of $189,002.00. Boone County homes during the January time frame were on the market (Days on Market) for an average of 99 days. There are currently 525 homes available for sale in Boone County. The average listing price for homes in the Campbell County area was $232,560.00 with an average selling price of $149,138.00. Campbell County homes during the January time frame were on the market (Days on Market) for an average of 133 days. There are currently 353 homes available for sale in Campbell County. The average listing price for homes in the Kenton County area was $231,576.00 with an average selling price of $167,049.00.